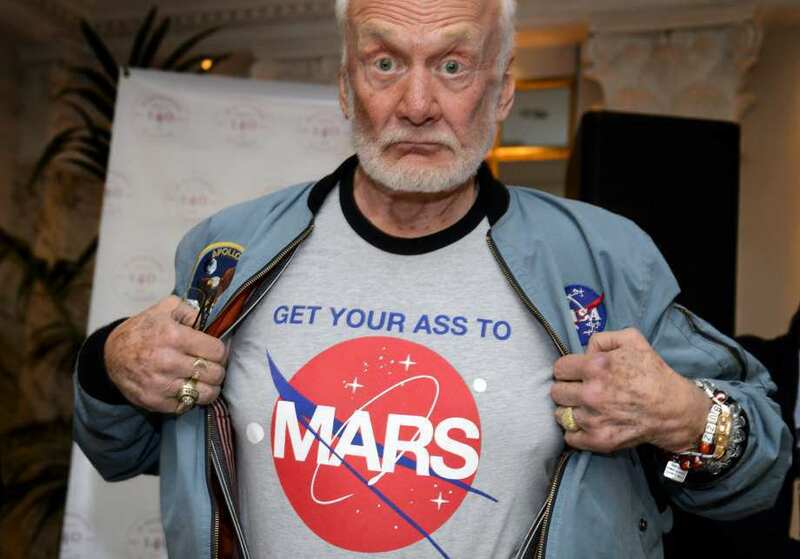 Buzz Aldrin's kids are worrying that he'll spend "their inheritance" before he kicks the bucket. Guess what? It's not your inheritance until he kicks the bucket. Also, Buzz Aldrin gets to eat, drink, smoke, and do whatever he wants, as long as he doesn't violate anybody's rights, it's all up to him. For those among us who don't know who Buzz Aldrin is, he's the 2nd man to have set foot on the moon. US astronaut Buzz Aldrin is suing two of his children and his former business manager alleging they stole money from him and are slandering his legacy. The lawsuit, which was revealed on Monday, was filed in a Florida court one week after his children petitioned to take control of his finances. His family members had told a judge that he requires a legal guardian because he is in "cognitive decline". The 88-year-old was the second man to ever walk on the surface of the Moon. In a Wall Street Journal interview last week, the former US Air Force colonel said: "Nobody is going to come close to thinking I should be under a guardianship." In his lawsuit, he claims that his son, daughter and former manager Christina Korp also undermined his "personal romantic relationships" by forbidding him from getting married. At issue is the management of his private company, Buzz Aldrin Enterprises, and his non-profit organisation, the ShareSpace Foundation. In a legal filing earlier this month, his children Andrew Aldrin, 60, and Janice Aldrin, 60, contended that their father had recently begun associating with new friends who were trying to alienate him from his family. They also said he has been spending money at "an alarming rate". Mr Aldrin's lawsuit claims that his son and Ms Korp had improperly taken control of his finances - including millions of dollars worth of "space memorabilia" and "space artifacts". It adds that they did so "for their own self-dealing and enrichment". The legal action also claims the pair had been slandering him for years by claiming he suffers from dementia and has Alzheimer's disease. He accuses his son of exploiting the elderly by "knowingly and through deception or intimidation" depriving him of his property, and his daughter of fraud and of not acting in his financial interest. Buzz Aldrin became my favorite astronaut when I saw the video of him punching conspiracy theorist Bart Sibrel in the face. Bart Sibrel had booked Buzz for an interview under false pretenses, then went on to accuse him of lying about having walked on the moon, and proceeded to follow Buzz and harass him for several minutes. Buzz asked to be left alone, tried to get away from and avoid the guy, and threw him a right hook only after being called a coward, a liar, and a thief. Last edited by Ironduke; 27 Jun 18, at 03:01. Has been on the Hornet several times and met him once while there. I will say he is a very natty dresser and well coiffed that is for sure. Edit: usually it is strangers who try to take advantage of seniors with money by endearing themselves in one way or another. Here we have not strangers but two children and a business manager. I wonder how the kids feel about "Their" inheritance being spent on lawyers by Dad and themselves. Dad seems pretty with it to go out and file a lawsuit. Last edited by tbm3fan; 26 Jun 18, at 06:21. If only it was just strangers. Unfortunately financial abuse of elders is like abuse of children - happens most often from people known to the victim. "stranger danger' is a lesser threat. I am with Ironduke. Not a cent of this belongs to his children and he can spend it as he wishes. His greedy, entitled children can go jump. My mother is getting on and we have had a number of family discussions about her will. I encourage her to spend as much as she can on herself while she can enjoy it and have made it plain that I don't feel entitled to anything from her. She has been a great mother and has helped out all of us at times. She can do what she wants with the money. It is hers. That is why I used the word usually instead of always. As an example, just last week, my 92 year old father got a phone call by a supposed court officer who told him there was an outstanding warrant for his arrest. My father, not being stupid, decided to have some fun with the guy after inquiring how could he have a warrant in Massachusetts being that he lives in California. The usual scam is your grandson is in jail and you need to post his bond...now. Last edited by Ironduke; 26 Jun 18, at 18:57. That is quite the imagination. Ether that or you have had a similar prior experience/life. What else do you remember about him? Actually not much more as I only met him for a moment below decks. The mob of people waiting on the hanger deck was were he would ultimately head. All in all I believe he has been on the ship three times. Definitely the 40th anniversary of Apollo 11 in 2009 I recall since being there. He was also at the reopening in September 1998 along with then Mayor Jerry Brown. I remember Brown as my father was with me and being a natural salesman actually got Brown to stop for a moment chatting him up. Can't recall the specifics of the third time. Now the 50th Anniversary of Apollo 11 is next year but where he will be who knows. Unfortunately financial abuse of elders is like abuse of children - happens most often from people known to the victim. "stranger danger' is a lesser threat.